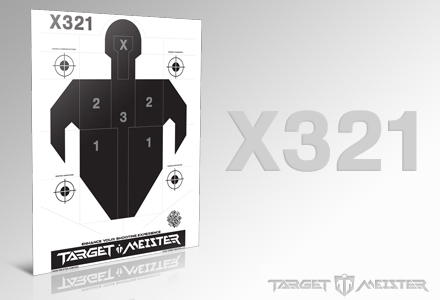 X321 is Target Meister’s official firearm training target. The design is derived from decades of forensic research from medical labs and the FBI. The X321 was devised to provide the most accurate and realistic representation of human kill zones compared to any other human-silhouette target available today. Training with X321 will improve your precision and prepare you for battle. The scoring system consists of four zones: X, 3, 2, 1. The “X” zone outlines an instant kill area. The “3”, “2” and “1” zones outline vital areas ranging in probability of a potential kill from highest to lowest, respectively. Additionally, there are four peripheral targets perfect for both handgun and rifle training. These 2-inch bullseye targets can be used for specialized training scenarios. We believe the X321 will be the best self-defense training target you have ever used. Shoot up a pack of X321 paper targets, and if you disagree, we will give you a 100 percent refund. The purpose of this target is to create human-realistic training targets that portray anatomically proportional suspects.